This knife far exceeded my expectations for rugged outdoor use. 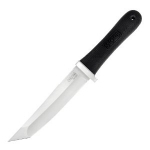 The 1/4 inch thick blade is virtually indestructable and holds an excellent edge. I have used this knife for splitting firewood, shapening a sticks for frog gigging, splitting open rotten logs for catching critters, filleting fish, and after that used it for cutting up my campfire grilled steak dinner and vegtables. 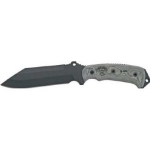 I also have the Spyderco Shemp Rock and find this blade does not compare to the TOPS Smoke Jumper. 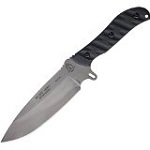 If you are looking for a rugged outdoor knife, this is the one.